I decided to make this block for the June edition of the Sew Pieceful Swap group. It was a bugger to make, but only because there were a million little pieces involved. (16 squares per block times 2 corners per square times 5 blocks = 160 pieces) Next month I really should pick a block with bigger/less pieces! 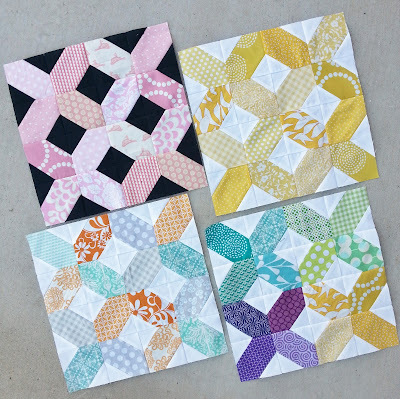 But the end result are these awesomely beautiful blocks. I loved how they turned out and hope that my bee mates love them as well. I know I'm not supposed to have a favorite, but I think I like the pink and black one best. **If you are interested in joining this swap go to the flickr page and sign up. This is a monthly swap, so jump in and out whenever you want. Sign ups start somewhere around the 20th of each month. wow! that's a LOT of pieces for a block. They are really cute though! I love the aqua and orange one! I love the multicolored block, but the black background fabric really makes the pink jump out. The members of your swap are lucky to be receiving these.